Georges Bugnet was born February 23rd, 1879 in Chalon‑sur‑Saône, Burgundy, France; educated at the University of Lyon and the Sorbonne where he married Julia Ley. He came to Canada in 1904 with his wife and small daughter. In 1905 they settled on a quarter section homestead 2 1/2 miles northwest of the present village of Rich Valley, Alberta (65 mites N.W. of Edmonton) where they lived for 50 years. In fact there was no name for the area at that time. It got the name Rich Valley ten years later. Farming on a homestead, heavily covered with large spruce, poplar and willows, was not an easy task. With time and hard work they overcame most of the difficulties encountered. Here they raised and educated five daughters and four sons. Mr. Bugnet's first interests in horticulture prior to working with roses were with apples, plums, cherries, trees, shrubs and perennials with the objective of developing hardy varieties for Alberta. An outstanding development in this field is the Ladoga Pine (a strain of Scotch Pine) which he hybridized using the seedlings he grew from seed obtained from the Lake Ladoga area in Finland. These 70 year old specimens are stiff on Mr. Bugnet's old homestead, which the Alberta Government Forestry Department purchased. They are using seed from these pines for reforestation and farm shelterbelt trees. The 17 acre plantation is called the Bugnet Plantation Historical Site. Due to his modest nature, it is not generally known that Mr. Bugnet in 1969 was made a Chevalier de l'orde des palmes académiques for his literary skill. The medal awarded by the French government in recognition of his work was presented to Georges Bugnet in a moving ceremony at the Legal Village Senior Citizen's Home (50 miles north of Edmonton). His first novel was "Nipsya" published in Montreal in 1924, which appeared in Toronto and New York in 1929 translated into English. Excerpts from this were used in the textbook "Highroads to Reading" for public schools in four Canadian provinces. His other novel "La Forêt" was published in 1935. Literary experts claim this novel the best ever written on the settlement of Western Canada. He had four other novels and a number of poems published. His son Maurice showed me some of his father's notes and correspondence. I found in them the most meticulous and finest hand writing I've ever seen. Mr. Bugnet was keenly interested in local education. He served as secretary of the Rich Valley School District for 30 years and a school trustee at Lac Ste Anne for 13 years. In 1957 he was made an honorary member of the Western Canadian Society of Horticulture. Mr. Bugnet's greatest horticultural achievement, in his opinion, is his "Thérése Bugnet," a hardy, deep pink, double, very fragrant shrub rose. It is a hybrid from the native Alberta rose, a Russian double wild rose and several cultivated species. It was named after his sister, a nun in France whom he thought very highly of. It is a very hardy 5 to 6 foot shrub rose which produces a profusion of double pink blossoms starting mid‑June and on until a killing frost in the fall. His son Maurice says that it took his father 25 years to develop the "Thérése Bugnet" rose. In the end he made no effort to introduce and register it. That fell to an admirer, Percy Wright, in 1950. Mr. Bugnet made no money from the rose. 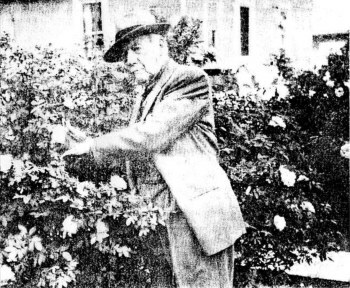 As a result of the numerous crosses, other hardy double flowering remontant shrub roses were developed: "Marie Bugnet," double, white, very thorny, 4 ft.; "Betty Bugnet," double, deep pink, 3 ft.; "Louise Bugnet," double, white, very fragrant, sparse thorns, 3 ft.; "Madeline Bugnet," double, pink, very thorny, compact 2 1/2 ft. bush. On his 100th birthday the Chancellor of the University of Alberta presented Mr. Bugnet with an honorary Degree of Laws in the St Emile Church in Legal, Alberta, At this presentation Mr. Bugnet said, "God has been good to me and I have enjoyed life to the full." This award and others he received is particularly satisfying for his family and friends who long ago recognized the value of his work. It is a source of pride for all who knew him that such a worthy recipient has come from the Rich Valley, Legal, Morinville area. Mrs. Julia Bugnet passed away in 1971 and Georges in 1981 at a ripe old age of 102.